This fabulous 857 acre lake is located about 40 miles north of South Bend, IN, about 100 Miles northeast of Chicago, and only minutes from Lake Michigan. Whether you are a sailing enthusiaist, fishing fanatic, or just enjoy the beauty of the water you will love living on Paw Paw Lake. 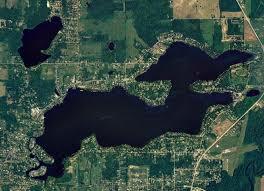 Paw Paw Lake has it all: boating, sailing, swimming, fishing, skiing, diving, beaches, resturants, golf and more!